Choosing the most appropriate type of engine oil for your car is very important to keeping your engine in a good running order. There isn't a perfect oil appropriate for all types engines or cars so you have to choose your oil based on a number of factors, including car type, engine combustion, and climate. The first step in choosing the right oil for your car is understanding what oil actually does for your car engine. The most important function of oil is that it prevents all the different metal parts that are moving in your engine from grinding against each other and destroying themselves in the process. Oil also reduces the engine's contact with oxygen resulting in reduced oxidation and it also has to trap all the potentially harmful by-products of the combustion process. That is why oil is crucial to your car's engine and choosing the right type shouldn't be taken lightly. It is also very important to understand what the grading system of oil means (the numbers seen on a bottle of oil, for example 10W-30). The number refer to the oil's viscosity (how thick it is and how fast it can flow) when tested and they represent the approximate number of seconds it takes for the oil to flow a determined distance at different temperatures. The "W" stands for "winter", so the first number represents the amount of time it took the oil to flow at 0° Fahrenheit and the second number is at 212° Fahrenheit. 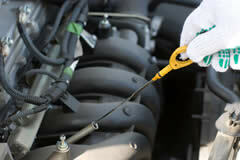 There are also three types of engine oils: fully synthetic, semi-synthetic and mineral. Synthetic oils are produced in a lab, while mineral oils are extracted natural oils, but refined. Semi-synthetic oils are the two previous types combined. The first thing you have to know when choosing what oil to use in your car is what the strengths and weaknesses of the three different oil types are. Each of the three types of oil have different advantages over the other. Mineral oils are the most versatile and they also work on a large variety of engines, but they offer only the most basic protection to your car's engine and they also have to be changed more often. Semi-synthetic oils offer the best protection for your engine, especially right after starting your car. On top of that, you don't have to change synthetic oils as often as the other types. On the other hand, fully synthetic oils can help you save money on fuel and in addition it offers protection to your engine from wear and build-ups, enhances your car's performances, while it also gets to the engine's moving parts quicker. After choosing the right type of oil for your car, you have to choose a certain grading for it and you will be able to find the recommended oil grading (e. g. 10W-30) in your car's owner's manual so make sure you check that before purchasing anything. In the end, the most important thing when choosing what oil to use in your car is to always buy quality oil. Buying cheaper, less quality oil can cause you a lot of trouble down the road that might end up costing you a lot more. That's why you have to keep an eye out for the right type of certifications when buying oil. The authority in the United States is API and in Europe it's ACEA and all quality oils will have their certificates somewhere on the bottle. Following these simple guidelines it's impossible to go wrong when purchasing oil for your car, but you also have to remember to regularly change your car's oil according to the owner's manual.